MSA Workman Fall Protection Harnesses offer comfort and safety at economical prices. Model 10072487 features a Back D ring and tongue buckle leg straps. Also available in Size XL (P/N 10072488). 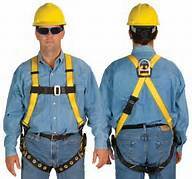 Workman full Body Harnesses also feature lightweight components and durable webbing.